Wednesday March 25th 1925 I did a little washing for myself and wrote Fannie, Nellie McCall and Major Briggs. I went down to call on Josephine Esker. Bought a hat I liked. Letter from Lydia. Thursday March 26th 1925 I came down to Waverly in the bus and was at Maude Andersons daughters for dinner. Then came on down to Piketon. I went to see Mrs Bateman and Mrs Patterson who had lost her husband lately. Wrote to Ida. Newton Patterson spent the evening with me. Friday March 27th 1925 I went down to Portsmouth before noon. Had dinner at The Washington Hotel. Then went right up to see Sallie Reed. Others came to call while I was there. Talked to Rev. Gleiser over the phone. I got back to Piketon in time for supper. Jake Ware called on the AM and Newton Patterson spent the evening here. Wrote Lydia. 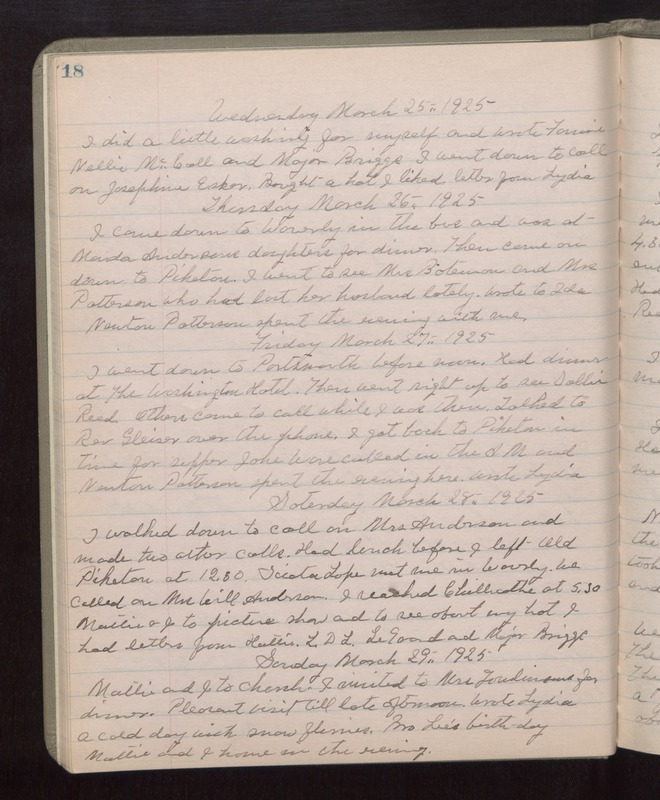 Saturday March 28th 1925 I walked down to call on Mrs Anderson and made two other calls. Had lunch before I left. Old Piketon at 12.30. Sciota Lape met me in Waverly. We called on Mrs Will Anderson. I reached Chillicothe at 5.30. Mattie & I to picture show and to see about my hat. I had letters from Hattie, L D L, LeGrand and Major Briggs. Sunday March 29th 1925 Mattie and I to church. I visited with Mrs Tomlinsons for dinner. Pleasant visit till late afternoon. Wrote Lydia. A cold day with snow flurries. Bro Lee's birthday. Mattie and I home in the evening.